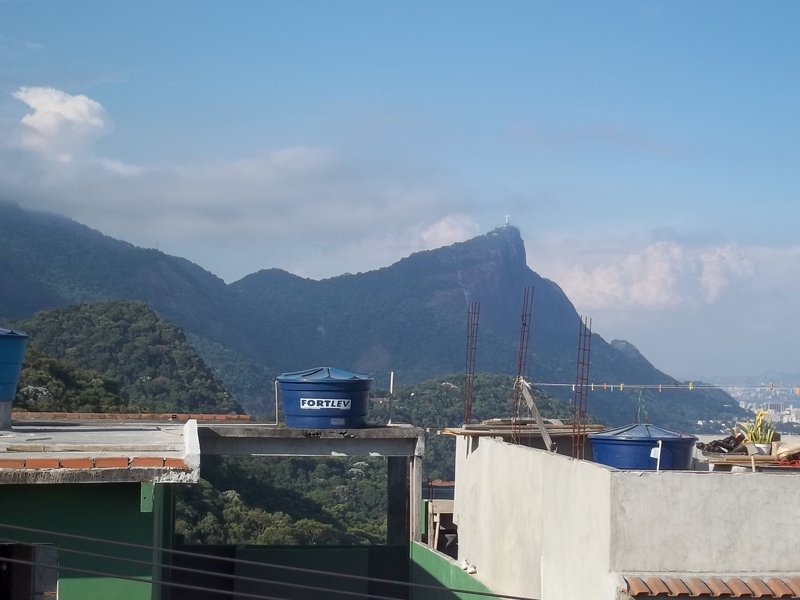 Lately I have been brushing up on building design and construction vocabulary in Spanish and Portuguese—words like padieira, propriadades higrotérmicas, and chumbador come in handy in my line of work—and that made me consider which building words might be unique to the world of building in favelas specifically. Language defines for us in many profound ways, the world that we inhabit. Some language theorists even go so far as to claim that language is not a tool for us but that we are a tool to language, that it is language that manipulates our engagement with the world and not the other way around. Consider, for example, the difference that “informal development” makes versus “slum” for example, in the way we engage urbanism. Indeed words wield a power we sometimes (most often?) take for granted. Autoconstrução – The act of providing all labor for construction of one’s own home. This is the proud heritage of the favela residence. Consider the Philosopher Martin Heidegger’s interest in building and dwelling. In his essay “Building Dwelling Thinking” he posits the idea that fundamentally building and dwelling are one in the same that we do not build in order to dwell but that our existence is dwelling—as in to remain in place, to bear and existential relationship to our surroundings and that dwelling entails a deep concern and engagement with our surroundings. Heidegger reinforces his position by indicating that building and dwelling both come from the same root, buan, in old English and High German. In this sense, autoconstructão is building and dwelling in their purest sense. 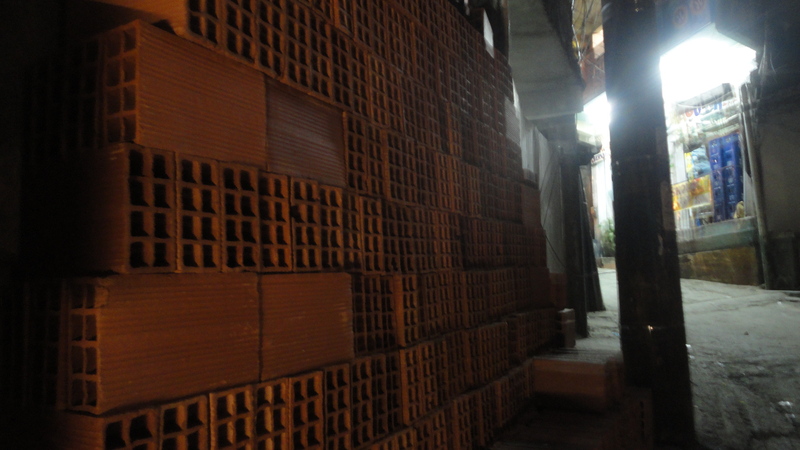 Bricks stacked and ready to go evidence the continual nature of autoconstrucão in Rua 4, Rocinha, Rio de Janeiro. Desordenada – Disordered. Brazil is a pretty modernist society: The national motto on the flag is “Order and Progress” and its major cultural centers are also centers of high modern architecture after the discipline of Le Corbusier. Order is a prized value. 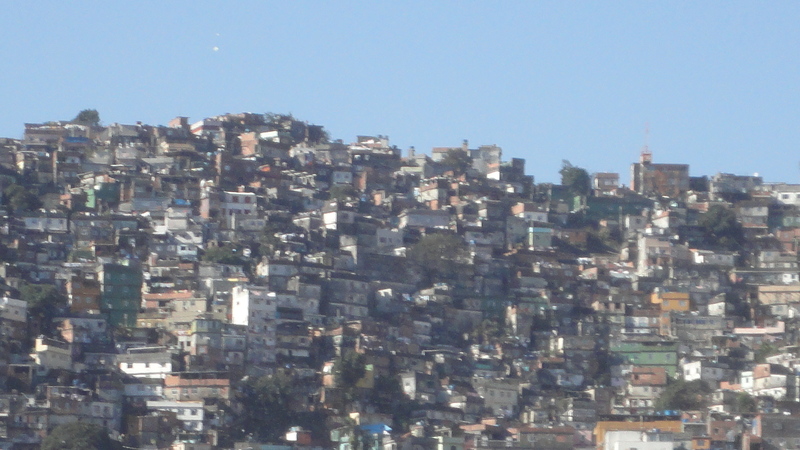 Quite often you hear the structure of favelas as “disordered.” There are of course other ways of looking at it that didn’t come to prominence until late in the last century namely deconstructionism, post-structuralism, and phenomenology, that don’t place quite the same premium on order as understood through classical architecture and mathematical proofs. Epoca de eleição – Election time. Quite often perceived as the time when politicians pay attention to issues important to favela residents—from lip service to public infrastructure problems. An incumbent may promise to invest in infrastructure and then may or may not carry through after election. This of course is not a unique phenomenon to Brazil, or Rio, or Favelas necessarily, but the stakes may be quite a bit higher for favela residents than many other places where this sort of attempt at quid-pro-quo voting may happen. And the practical results are difficult to ignore. Gato –An illicit connection to a utilities grid. 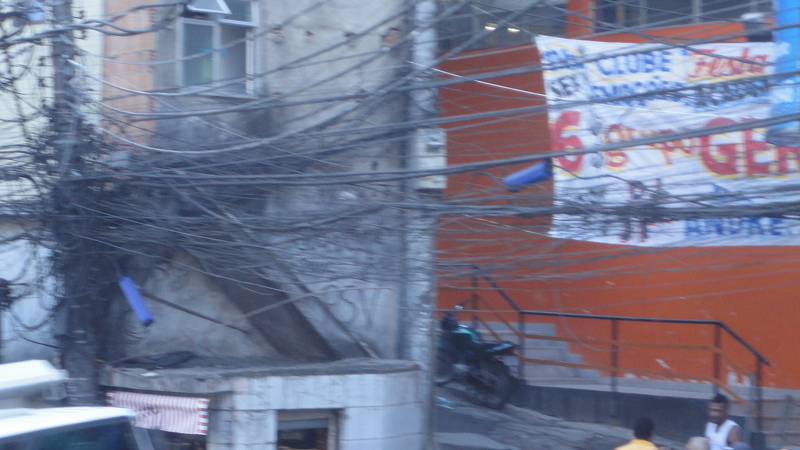 The informal and impoverished nature of favela development typically entails connecting to existing utilities grids with no previous official permit. Gato is most commonly used to refer to electrc energy but it can also apply to other utilities like cable or internet as well. Grileiro – A professional forger of real estate documentation. Related – Grilagem. The act or practice of creating false ownership documentation of real estate.The term is said to come from the process of intentionally exposing forged documentation to insects (Grilo means cricket) that would then live in, consume, and defecate on the paper giving it the appearance of age and thus authenticity. Currently, grilagem is the practice of falsifying real estate ownership. 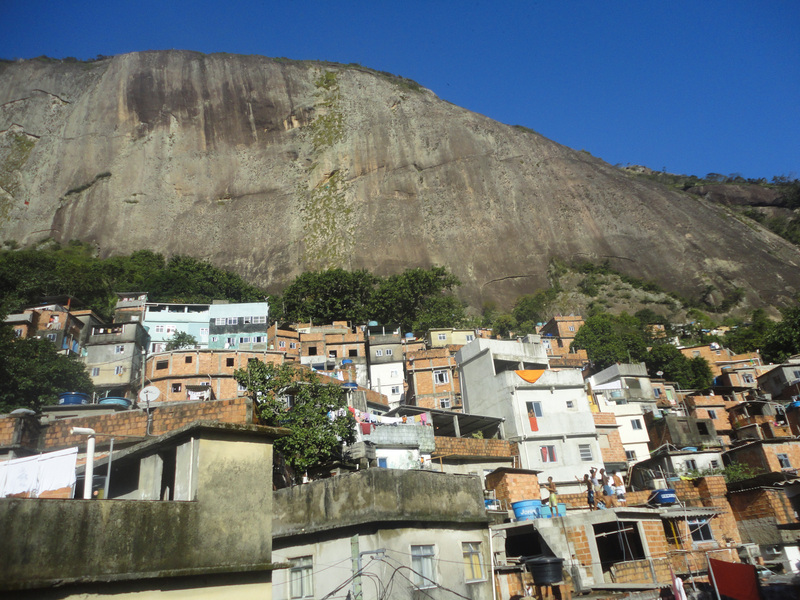 Favelas have been created by illegal/informal parceling of land and dubious ownership status facilitated by the practice of grilagem. 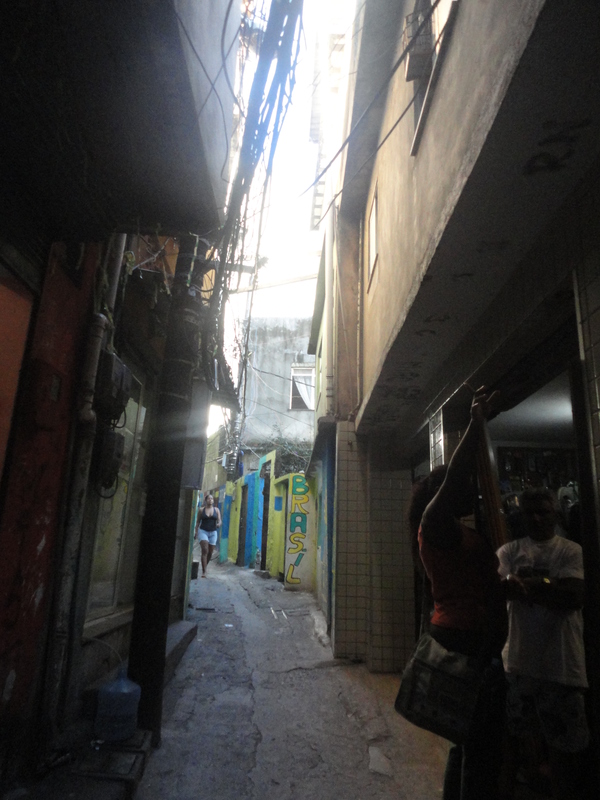 Beco – The narrow, and often winding street that comprises the primary circulation in favelas. Becos develop by scaling circulation paths based upon the human body and pedestrian travel rather than upon motorized transportation. Becos can make for seriously interesting urban morphology—the same sort of interest that draws tourists to the medieval neighborhoods in Europe—but it can create serious complications in public health and safety. For example, when sewer lines burst or in heavy rain events, the beco can be the path of least resistance for the water. 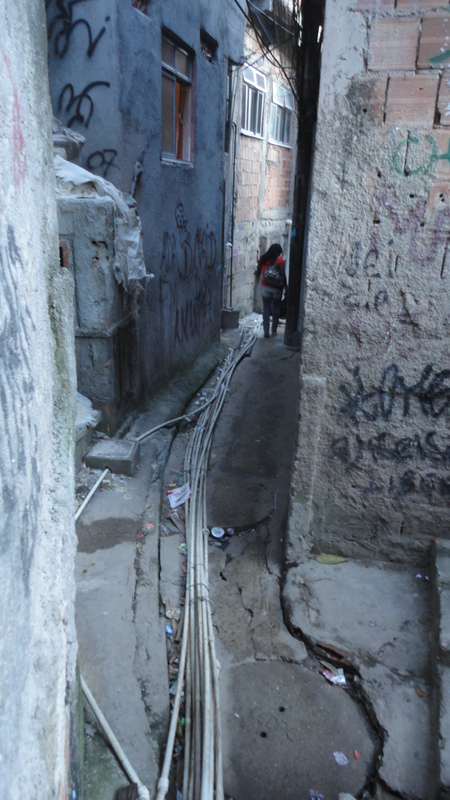 This beco, in roupa Suja, Rocinha demonstartes the potential for mishap by serving as utilities corridor as well. Barraco – A very basic (“tosca” or rude, rough, rustic, badly-made appears in some definitions) home quite often made from salvaged materials such as small lumber, corrugated metal, plastic, and cardboard. 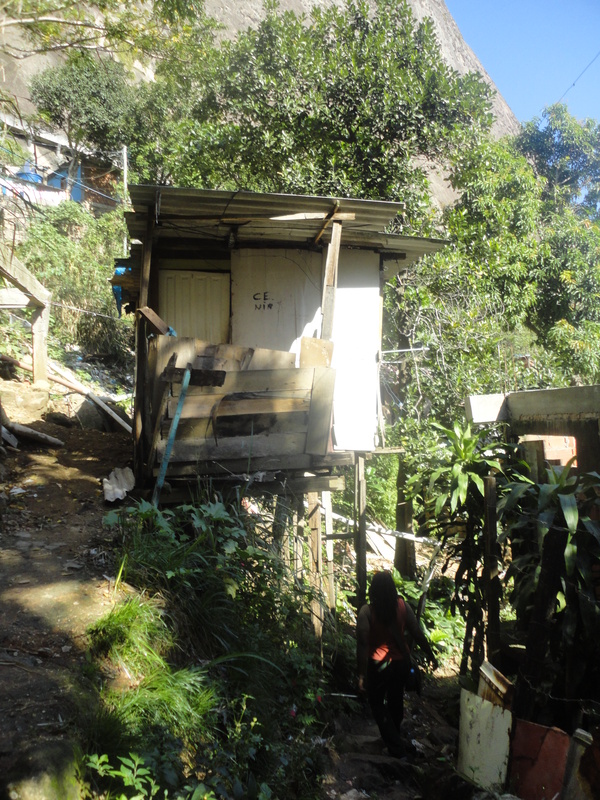 Typically these sorts of homes appear at the outer margins of favelas and are eventually replaced by more permanent and durable structures. It had never occurred to me until now, but it’s probably a cognate of the English word “barrack” in the sense of temporary housing accommodations. As indicated by some of the synonyms for “tosca” above, barraco carries with it some significant social stigma representing housing for the poorest of the poor. Laje – The roof slab of typical masonry and/or concrete home. The laje serves many useful day-to-day functions including laundry and utility area, outdoor recreational living space (sunbathing, outdoor grilling, flying kites), and cases of favelas set on hillsides, a laje can provide a spectacular view of the surrounding neighborhoods, city, landscape, and in Rio, the beach and ocean. The laje is a culturally significant for the reasons above, but also because structure and form of the roof slab provide the basis for the ever changing form of favelas in that the roof of a single story can become the floor plate for a subsequent construction. Quite often the reinforcing steel is left extended past the level of the concrete in order to later tie in to future construction. Corcovado and Cristo Redentor as seen from a laje in Laboriaux, Rio de janeiro. You can see the various stages of finish and some uses (laundry line, water tanks) of the two lajes in the forground. The reinforcement visible on the right may yet tie into the structure for new additions to that home. Practically just as much life happens on the laje as inside the house. Rua 3, Rocinha. Mutirão – An act of neighborly cooperation to complete a necessary task such as building or improving a home or neighborhood infrastructure. 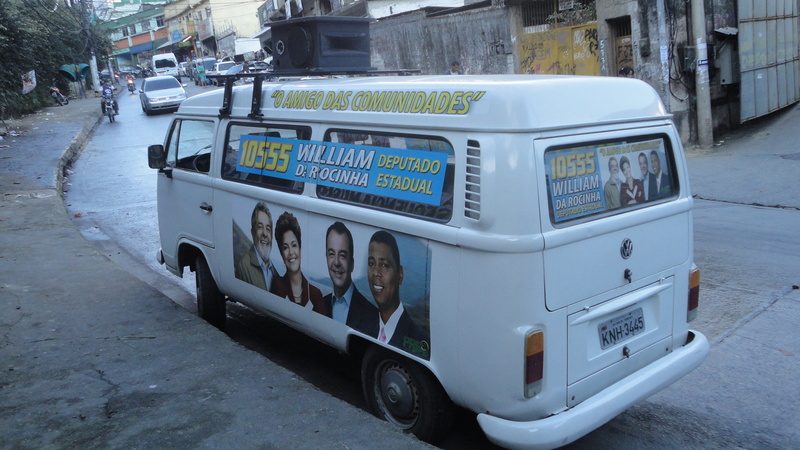 While historically and normally this idea is deeply communitarian, it has also at times been appropriated by politicians such as by Rio Governor, Carlos Lacerda in the 1960s with “Operação Mutirão” that was assigned to build “community centres, medical stations, and schools” until it fell to pressure from real estates interests. 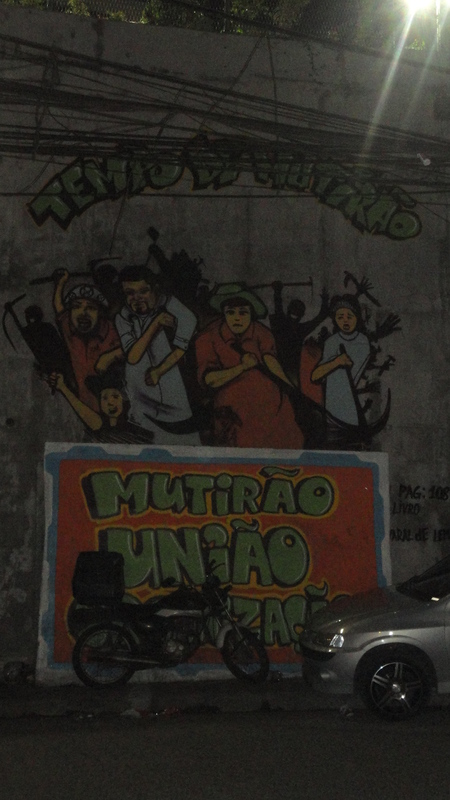 The idea resurfaced years later under another Rio governor, Leonel Brizola, with the name “Projeto Mutirão.” I personally love the sense of solidarity and community that are encapsulated in this word—it represents a sense of common interest in private well-being, the notion that we really are all in this together. I know there are many more. Have any to add, please do so using the comments below. At any rate, we’ll keep the list expanding in future posts.